Are spiritual quests only for the privileged? 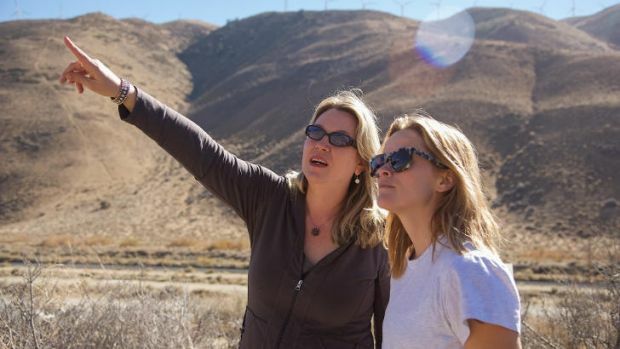 Cheryl Strayed knows that self-discovery is less about giving into endless pleasure than it is about tackling the thing that's getting in your way. Near the start of Wild - the much-loved memoir that sees the 26-year-old Strayed hike America's 2,650-mile Pacific Crest Trail to absolve herself of a grief spiral brought on by her mother's death and marked by one-night stands, heroin and a marriage breakdown - she's faced with an obstacle both benign and brutal: a tree that had fallen across her path, too low to pass under but too high to climb. She hoists her gargantuan backpack over the trunk and tears open old wounds while clambering over the other side. "The thing about hiking the Pacific Crest Trail was how often I had to do the thing I least wanted to do [...] I could go back in the direction I had come from, or I could go forward in the direction I intended to go," she writes. Issued to coincide with the book's widely-hyped Hollywood adaptation, the new Wild paperback is strangely at odds with the ordinariness of this sentiment, thanks to its image of a still-comely Reese Witherspoon and overblown publishing-house caption, "A journey from lost to found." Wild is often mentioned in the same breath as Eat Pray Love - the Elizabeth Gilbert bestseller that also features a white woman's attempt to heal herself by abandoning the familiar - and lays claim to the same glowing endorsement from Oprah's Book Club, but it swaps hard-won epiphanies in Italian trattorias and tearful goodbyes in Indian ashrams for moments of quiet decisiveness. So, how does a book whose protagonist's spiritual journey is marked by missing toenails sell nearly two million copies and inspire a wave of solo hikes on the edge of a continent? Strayed's prose has a quicksilver quality, but phenomenons aren't built on talent alone. In a December 2014 article in Salon, Andrew O'Heir attempts to find out why journeys of self-discovery in literature tend to inspire legions of imitators - whether it's turtleneck-clad Jack Kerouac wannabes using drug-heavy road trips to cure twentysomething angst, newly-divorced women splashing out on a Gilbert-style Balinese odyssey complete with overpriced witchdoctor, or Strayed acolytes whose pick 'n' mix afflictions ranging from burnout to depression are best served by a grueling walking trail known for sprawling desert and icy peaks. The answer has almost nothing to do with the writer's emotional context and everything to do with the fact that quest narratives belong to a Western literary tradition in which "finding yourself" hinges on the presence of a far-flung Other, whose authenticity brings your own truth sharply into focus. The scenery might switch between Kerouac's heady African-American jazz clubs, Gilbert's technicolour Indian wedding and Strayed's snow-covered High Sierras, but it's the process that makes it easy to emulate - as O'Heir writes, "the problem with all self-help or inspirational literature is always the same: People want to take it literally, and we have a tendency to mistake the map for the journey." Mistaking the map for the journey might give rise to life-changing realisations, but it's not as innocent as it may seem. In an August 2014 Storyacious article on trailblazing female explorers, Julie Kirk writes about how 19th century women such as Isabella Bird and Gertrude Bell took solo sojourns through Africa, the Middle East and Japan to achieve the freedom that eluded them in stuffy English sitting rooms, only to find that their empowerment stemmed as much from "feeling like an intelligent, educated and mannered person amidst the natives" than it did from the voyage itself. For Sandip Roy, it's precisely the way quest narratives are rooted in class and race privilege that make them insufferable to nonwhite readers. "Where do those people in Indonesia and India go away to when they lose their passion, spark and faith? I don't think they come to Manhattan," he wonders in his 2010 Salon essay 'The New Colonialism of Eat Pray Love'. When history treats you as something to be explored, mapped and mastered, chances are you won't find solace in the wilderness either. But although the tradition that Wild is part of is problematic, we shouldn't dismiss its success. In December 2014, Strayed - who grew up in a house without indoor plumbing and whose single mother worked long hours waiting tables - told Vulture that when she was writing the novel she "made no attempt to be the authority" and that "the authoritative voice that white men of privilege have assumed, and have also been granted - that is the difference between their voice and mine." Wild owes its beauty to the way it uses one woman's story to mine the universal nature of pain, destructiveness and grief. "It was my life, like all lives, mysterious and irrevocable and sacred," Strayed realises at the end of her hike. And no matter what brand of spiritual quest appeals to you, all lives deserve the chance to be redeemed.